Fiskars Stainless Steel Border Spade provides a lightweight ergonomic and high-quality garden tool with polished stainless steel head and strong ash wood shaft, finished off with a ‘D’ shaped comfortable plastic handle. Supplied with a lifetime guarantee. 90cm total length including 47cm stainless steel head. Border spade weighs 1.58kgs, making this a lightweight strong border fork with a four pronged fork head. 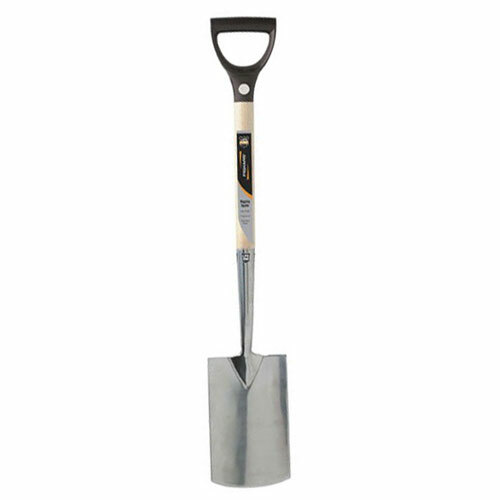 Border Spades are smaller versions of the workhorse garden spade but despite their smaller size, these border forks are hard working garden tools and great for working in tight spaces. Stainless steel head enters the soil more easily and helps prevent rust.